Direct immunofluorescence antibodies, usually IgG, can be shown by an antihuman IgG antibody labelled with fluorescein. When viewed under the microscope with ultraviolet light illumination, the presence of the IgG antibody is shown by fluorescence. 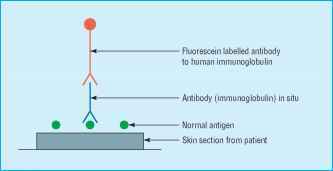 The presence of circulating antibasement membrane antibodies in the serum can be shown either by direct immunofluorescence using a specimen of the patient's skin or by incubation by attachment to skin which has been incubated in serum from the patient. 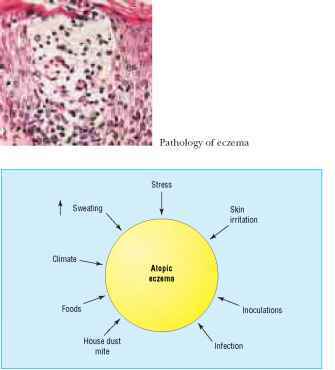 The clinical features are described in chapter 8. The blisters develop, frequently with an erythematous background, on the limbs, trunk, and flexures. It is mainly seen in the elderly and is slightly more common in women. In this condition, antibodies are found to have developed against the epidermis above the basement membrane. The main antibody is IgG, but IgM and IgA may also be found. As a result of this reaction, there is separation of the epidermal cells with the formation of a superficial blister. A row of basal cells remains attached to the basement membrane. Direct immunofluorescence of the skin from affected patients shows that antibodies are deposited on the intercellular substance of the epidermis. Circulating antibodies are often present. Oral lesions are much more common than in pemphigoid.